Buying at CableChick takes me back to the times when the companies did remember that they are living thanks to clients. Your professionalism, the quality of service, with information given from order to delivery (the fastest I experienced) are not common. In this economic storm, people like you who do respect their customers will make the difference, and will win. Ok, ok. So infinity might be out of reach for a simple cable, but there are two things that get this FireWire 800 cable closer than all the rest. First off – it's a whopping 5 metres long! You can keep your digital camera/camcorder locked to its tripod and still hook it up to a high-powered desktop computer for real-time recording! The next biggie is that it's IEEE1394b ready, which grants us the 800Mbps data transfer rate that gives FireWire 800 its name. That kind of signal speed is essential for high-resolution transfers on premium AV equipment. This high-end 5m FireWire 1394 9P to 9P cable is further enhanced by twisted pair constructed that is triple shielded for maximum protection from interference and cross-talk; imperative for these long runs. Gold connectors also round out the infinitely impressive package by offering error-free transmissions every time. 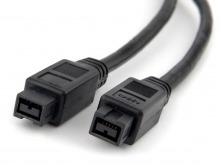 You can hot-swap these plug-and-play cables between a range of devices from Digital Camcorders to FireWire Hard Drives, and you can run them to both Windows and AppleOS based computers as required. So if you're using cables that aren't fully optimized, or you're looking for maximum range on your film set, you need to get one of these! Twisted pair design and triple shielding. Plug-and-Play hot swap compatible – connect and disconnect without powering down. Fast data transfer at up to 800Mbps (device dependant). Meets FireWire 800 and 1394b specifications. 5 metre IEEE 1394b Specification twisted-pair cable. 9 Pin Male FireWire to 9 Pin Male FireWire. 24K Gold-Plated connectors and terminals. Up to 800Mbps data rate. Also known as Firewire 800, DV Cable, 1394b, i.Link. Perfect for all FireWire/iLink Camcorders. Very happy, thank you. It was disturbingly simple and well organised, especially considering the time of year. I will certainly be recommending Cable Chick to others.